Place a wok over medium high heat and allow to preheat. Then, add in cooking oil and swirl the oil around to coat the wok. Throw in garlic and give a quick stir. Add luncheon meat and stir fry until lightly browned. Put in kimchi and stir fry until almost cooked. Add in mushrooms and stir to combine. Bring the heat down to medium low. Mix in rice and kimchi juice. If you do not have sufficient kimchi juice from the container, mix 2½ tbsp kimchi juice with 1 tbsp gochujang paste or soy sauce instead. Stir well to combine thoroughly. Then, add in sesame oil and continue to stir well to combine. In a separate pan, heat up some oil and fry eggs sunny side up style. 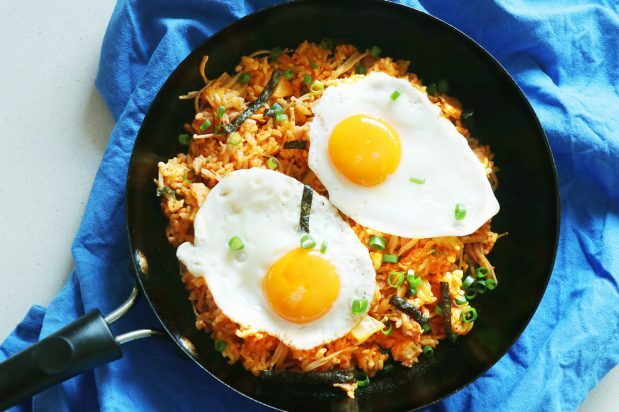 Transfer kimchi fried rice to individual plates and top with fried egg. Garnish with sesame seeds, spring onions and strips of roasted seaweed.